First, there were the Jekkies – the fervently devoted fans of Frank Wildhorn’s Jekyll & Hyde. Throughout the show’s long 1995 cross-country tryout, they kept appearing at the various theaters, sparing no expense to see their beloved musical. And the Jekkies begat the Pimpies, who equally celebrated Wildhorn’s The Scarlet Pimpernel. They in turn begat the Civvies, the devoted enthusiasts of Wildhorn’s The Civil War. Now we may well have the Wondies – those who become passionate admirers of Wonderland, Wildhorn’s newest musical. In case there’s any doubt as to what it is, the subtitle certainly seals the deal: Alice’s New Musical Adventure. Wonderland debuted at the Straz Center for the Performing Arts in Tampa last December, and then segued to the Alley Theatre in Houston. The engagements forged an original cast album, now available through digital download. Now Wildhorn and long-time collaborators Jack Murphy (lyrics and book) and Gregory Boyd (book), are taking their shot at the classic. They’ve contemporized the story by turning their Alice into a descendant of the original Alice, one Miss Liddell. She’s Alice Cornwinkle, a novelist, mother, and wife – though that last situation is about to end, for her husband Jack has just signed the divorce papers. It’s “The Worst Day of My Life,” Alice rants in the opening song. (Janet Dacal, who’s been In the Heights, now metaphorically goes down the rabbit hole as Alice.) As longtime Broadway observer John Harrison said when he heard the opening number, “You can see Britney Spears swinging her hair back and forth while she sings.” Of course, she wouldn’t be the first Wildhorn singer to do that; Robert Cuccioli holds that distinction in the hair-tossing-back-and-forth category for having played both Jekyll and Hyde in the same song. Wildhorn’s ballads can be tinkling-piano tender, such as the one Alice and Jack’s daughter Chloe has when she sings in broken-hearted fashion about her broken “Home.” But Wildhorn also likes the ballads that start off wistfully and increasingly turn up the power. Exhibit A is “Once More I Can See,” Alice’s where-did-it-all-go song. Not that Alice isn’t up for her adventure in Wonderland. The Act One closer, “Through the Looking Glass” is so infectious that the authors bring it back to start Act Two. Perhaps, but there’s a lot to savor in the Queen’s number. Though this is a pop-infused score, Wildhorn doesn’t ignore the traditional Broadway sound, and proves he knows how to write a show-stopper. Hence, the Queen’s “Off with the Heads.” For such a role and sound, one needs a diva. Here’s Karen Mason, who’s portrayed such grand Broadway ladies as Norma Desmond in Sunset Boulevard and Velma Von Tussle in Hairspray. 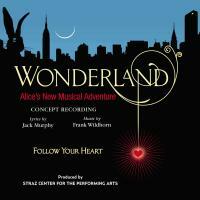 After Alice wraps it up with “Finding Wonderland,” there’s a bonus track from Wildhorn and Murphy’s original demo. Rob Evan sings “Go with the Flow,” one of El Gato’s songs. Evan, as any self-respecting Jekkie can tell you, eventually took over as Jekyll and Hyde; his singing appearance here should be good news to them, and especially to that woman who saw him perform the role more than 500 times. Wonderland is an album that will get one’s juices flowing early in the morning. All of us have had the experience of playing music while we’re getting dressed — and getting so carried away by what we’re hearing that we start dancing by ourselves right in our living rooms. The Civvies undoubtedly did this in their skivvies, and now the Wondies will do it in their undies. Peter Filichia also writes a columns for www.theatermania.com/peterfilichia each Monday, Wednesday, and Friday.